Adding homemade candle labels to your handcrafted candles or candle gifts is an easy way to share vital information, greetings, and other details about the candles. Proper labels, however, are more than just informational stickers and should be chosen for their versatility and appropriateness. There are several types of labels you can choose from when deciding how to put information on your candles. Greetings: Greeting labels are whimsical notes or sayings that can be easily personalized for special occasions and gifts. Warning labels: Essential safety information and burning tips are found on warning labels. Informational labels: These are the most common labels and may include the scent or name of the candle, a company logo, or ingredient information. Where labels are placed on a candle can make a strong impact on the candle's appearance. Warning labels are generally placed on the bottom of the candle so they are less likely to be removed. In comparison, greeting and informational labels can be on the candle's side or the lid of a tin or jar candle. If the candle is packaged in a gift tin or multi-pack, the informational or greeting label may be placed on the container rather than the candle itself, and some labels are designed as removable tags for convenience.Homemade candle labels can also be used to cover a store label on a purchased candle. This is an easy way to personalize a gift or to add a customized touch for a special occasion. Greeting messages for birthdays, weddings, etc. Not every candle label needs every piece of information. 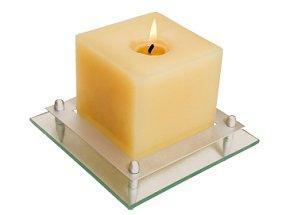 Choose the details you wish to include based on the purpose of the candle. Once you know the type of information you want to include on the label, you should have an idea about the size of label you need. Label sizes should also be proportional to the size of the candle so the label does not overwhelm the beauty of the candle. Some companies offer clear labels so more of the candle is visible. Removable labels are another option as well. Water resistant labels are best for homemade scented candles, since a minor imbalance in the wax, color, and scent ratios can make the surface of the candle slick and regular adhesive may not be strong enough. Always test one label to see if it adheres strongly and smoothly to the candle. Consider the candle's shape when choosing an appropriate label. The label should be able to adhere smoothly to the surface of the candle, jar, or tag without any bubbles, creases, or folds. Many office supply stores and craft stores have a variety of printable labels available. Some companies even supply basic candle warning labels in convenient rolls. If your printer is not suitable for making your own candle labels, many online companies offer printing services complete with online label design tools and extensive customization. Labels are easy to find. Print a single label as a sample first, or use an online preview tool to ensure the information is readable and the design is appropriate. Customize labels with artwork related to the candle's scent, color, or purpose. Adding a representative flower to a spring candle, for example, is a beautiful and practical touch. Be sure to choose a readable font style and size if printing candle labels. Use calligraphy, rubber stamps, stickers, or other touches to decorate candle labels by hand for a more homemade appearance. Consider crimping or trimming the edges of labels for a rustic touch. If you make the candles yourself, use a generic label on a sample candle to list ingredients and special instructions so the candle can be easily duplicated. 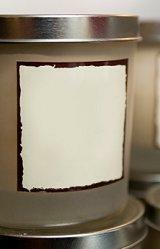 Homemade candle labels add personalization and whimsy to candle gifts or a home candle making business. With many design options available, it is easy to include all necessary information on a beautiful and coordinated label.